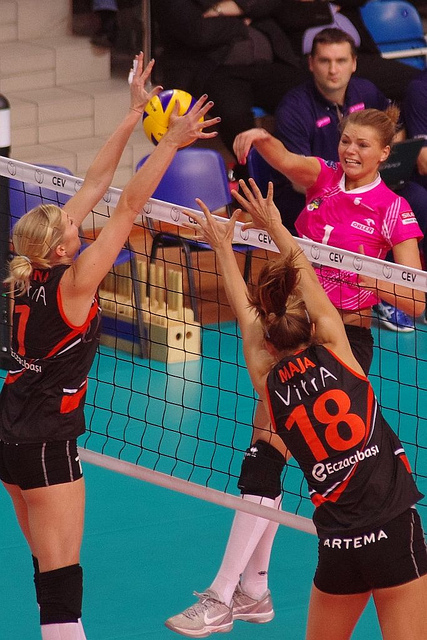 When blocking do you watch the ball or do you watch the hitter? Regardless of the types of blocking in volleyball that you do its always important to watch the hitter or hitters that you are going to block in order to pick up important clues that will help you stop the attack at the net. Ball - Setter - Ball - Hitter is the pattern of movement your eyes as you are blocking in the front row (also the back row defense but we will get back to that later) should follow when in the front row, after your team's server has served the ball over the net. These are the places you should be looking at, in other words where your eyes should be looking...to get clues as to who and where the opposing team now on offense intends to do with the ball (give the ball to), for their third contact... an attack hit that will send the ball back into your court. Your job as a blocker is to stop that ball at the net. 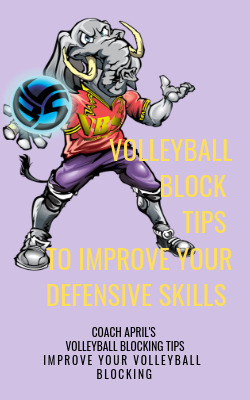 These volleyball block tips will show you how. 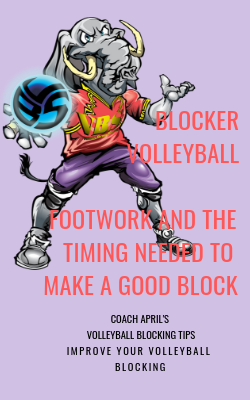 Watch the blocking footwork practice we do in Volleyball Voice Boot Camp classes. Once your server serves the ball over the net to start the rally, you first want to track with your eyes the BALL that's being passed. What are you trying to quickly evaluate about the pass? 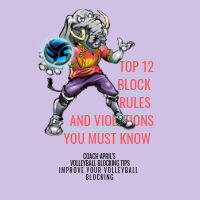 What information do you need to quickly get that will help you make a good volleyball block action? If its a perfect pass that goes right to the setter then you know the setter doesn't have to move off the net to go chase a bad pass. Okay so as a blocker that will tell you right away the setter is in a position to use ALL of her possible hitters to run an offense. If three hitters are in the front row then she has three players she can set to. If there are two hitters in the front row then she can easily set those two hitters or try to dump or attack the ball herself. 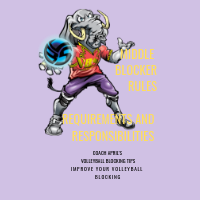 If the pass was a bad pass that forces the setter to move off the net and chase the ball down...now as a blocker you say to yourself "Self, the setter is in trouble and can't make a perfect set to all of her possible front row hitters! Because of where and how she is chasing the ball down, WHO is the most likely hitter or hitters can she set or give the ball to..in this situation?" "By the way, good job, Self!" 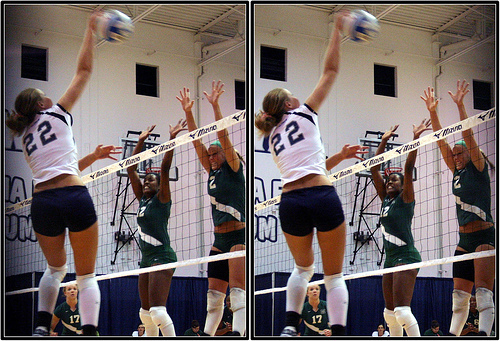 Once you've quickly made a determination on the pass, now your eyes go to the Setter. 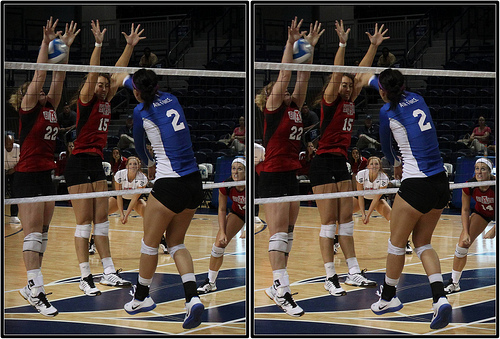 If it was a perfect pass, now you watch the setter's body language, hand position. Some setters will show with their setting body position, that they intend to make a back set because they arch their back alot when then do, but when making a front set or a set to the middle, they don't. 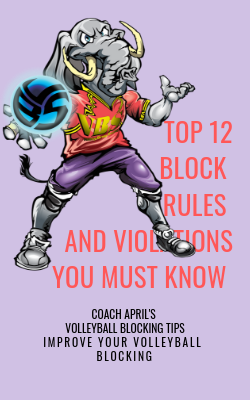 These are the types of skill cues and clues in blocking you are trying to read and interpret as a blocker in order to improve your defensive skills! If it was a bad pass you do the same thing. 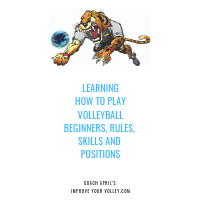 But because you've identified that the setter is in trouble and can't easily deliver a perfect set to all her possible hitters, you look to pick up clues from her body language. Is she running off the court or to her back court with her back to her hitters? If that's the case, she will probably not even be able to set the ball with her hands but will bump it up in the air. "Now Peep The Ball Again Right Quick"
Once we've glanced or watched the setter to get some information about what she is about to do, now we watch the ball she just touched. 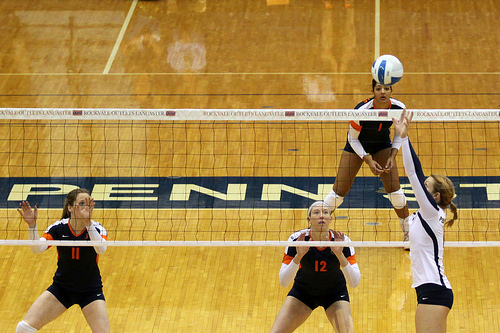 Is it a high ball or a faster set like a "Hut" or a "Go"? Is the ball going to the hitter in front of me or to the middle or to the other hitter in front of my teammate on the other side of my middle blocker? 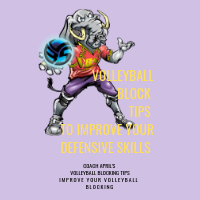 "All Eyes On The Hitter"
By quickly determining where the ball is going you can then determine where you need to move and the type of blocking you need to do next. Now hopefully from these volleyball block tips you've found out a sure way to increase the number of blocks you can successfully perform in a match.